President of Ukraine Petro Poroshenko has approved the ratification of an Agreement on Ukraine’s participation in the EU programme for the Competitiveness of Enterprises and Small and Medium-sized Enterprises (SMEs) (COSME) (2014-2020), the president’s press service reports. 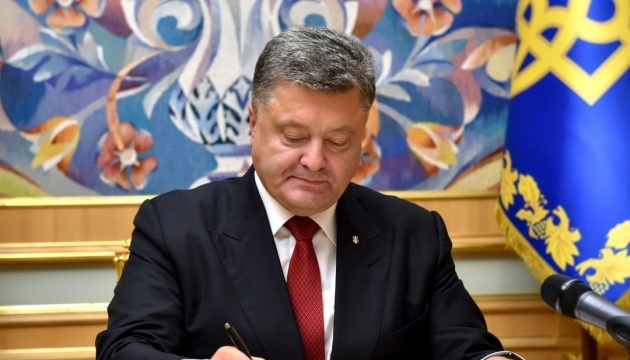 "President Petro Poroshenko signed the Law of Ukraine “On ratification of the Agreement between the Government of Ukraine and the European Union on Ukraine's participation in the EU programme for the Competitiveness of Enterprises and Small and Medium-sized Enterprises (COSME) (2014-2020)". The law was approved by the Verkhovna Rada on February 22, 2017,” reads a report. The ratification of the COSME Agreement will allow Ukraine to implement projects in the following directions: improving conditions for the access of small and medium-sized enterprises to markets; improving conditions for competitiveness; formation of business culture.